Those of us who can see colors normally tend to take that ability for granted. Designer Christopher Yamane has developed a device that will help people born with a condition called achromatopsia see colors by involving their sense of hearing. Achromatopsia is a rare and often-misunderstood medical syndrome which causes the inability to see color. The Wassiliscope induces a kind of artificial synesthesia, a condition in which people experience one sense as a different sense – seeing sounds, for instance. This particular type of artificial synesthesia causes users (who may have always seen only in black and white) to hear colors. 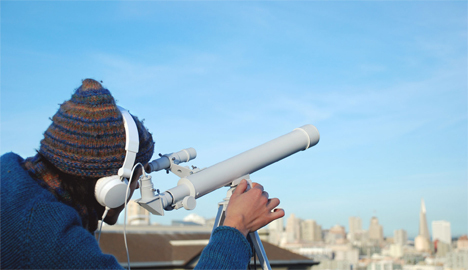 The Wassiliscope translates the colors’ light frequencies and translates them into their corresponding sound frequency. The video above gives a demonstration of the setup, including the sounds of several different colors. A lifelong achromatopsia sufferer named Neil Harbisson famously wears an “eyeborg,” a gadget that lets him hear colors. 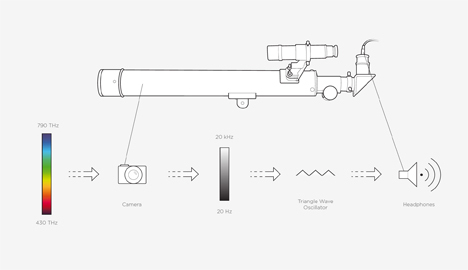 The Wassiliscope works on the same principles of capturing visible light frequencies and translating them into sound frequencies. Yamane was struck by the idea when he realized that colors and sounds are made of the same stuff: waves. From there, he put together this complex machine that analyzes light wave frequencies, processes those waves through a triangular wave oscillator and sends them to the earphones as sounds. It might as well be magic as far as we’re concerned. See more in Cybernetics or under Technology. February, 2014.